The resolution that was passed by the United Nations Human Rights Council in 2008 also called for the formulation of “Principle and Guidelines.” In discussions of the Advisory Committee, two areas surfaced as the major focus of debate: segregation and termination of leprosy facilities. The members of the Advisory Committee were of the opinion that “leprosy is an infectious disease and therefore segregation would be required from a public health perspective.”　Thus the word “segregation ” was left in the final draft denoting that “there could be temporary segregation required.” We objected strongly to the inclusion of this word “segregation” as it is the very word that symbolizes discrimination. It was finally decided that this word would be dropped from the text. After a number of twists and turns, the resolution to eliminate discrimination including the “Principles and Guidelines” was finally unanimously passed by the UN Human Rights Council in September 2010. Yet I was still not totally satisfied and asked the Japanese Government to submit a resolution before the UN General Assembly. The result was that the resolution sponsored by the Japanese Government, with 84 co-sponsor countries, was unanimously adopted by 192 countries in December of the same year. 1. Persons affected by leprosy and their family members should be treated as people with dignity and are entitled, on an equal basis with others, to all the human rights and fundamental freedoms proclaimed in the Universal Declaration of Human Rights, as well as in other relevant international human rights instruments to which their respective States are parties, including the International Covenant on Economic, Social and Cultural Rights, the International Covenant on Civil and Political Rights, and the Convention on the Rights of Persons with Disabilities. 2. Persons affected by leprosy and their family members should not be discriminated against on the grounds of having or having had leprosy. (c) A child should not be separated from his or her parents on the grounds of leprosy. 4. Persons affected by leprosy and their family members should have the same rights as everyone else in relation to full citizenship and obtaining identity documents. 5. Persons affected by leprosy and their family members should have the right to serve the public, on an equal basis with others, including the right to stand for elections and to hold office at all levels of government. 6. Persons affected by leprosy and their family members should have the right to work in an environment that is inclusive and to be treated on an equal basis with others in all policies and processes related to recruitment, hiring, promotion, salary, continuance of employment and career advancement. 8. Persons affected by leprosy and their family members are entitled to develop their human potential to the fullest extent, and to fully realize their dignity and self-worth. Persons affected by leprosy and their family members who have been empowered and who have had the opportunity to develop their abilities can be powerful agents of social change. 9. Persons affected by leprosy and their family members have the right to be, and should be, actively involved in decision-making processes regarding policies and programmes that directly concern their lives. The unanimous adoption of the principles of non-discrimination by the UN General Assembly had an extremely important meaning. 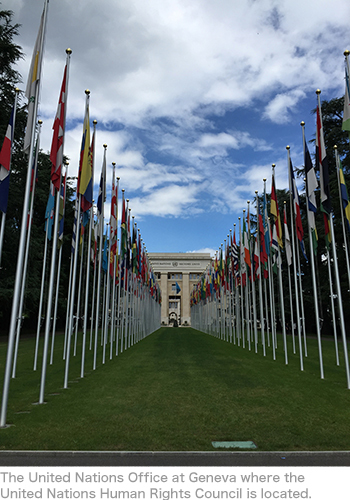 Looking back, I realized that a full seven and a half years had passed since I knocked on the doors of the UN Human Rights Council without having a notion of the outcome. Of course, the UN adoption of non-discrimination does not mean that my fight has ended. Discrimination that people affected by leprosy and their family members face cannot be solved overnight. It was important now to have as many people to know the “Principles and Guidelines”. In order to promote a wider understanding and stimulate public awareness throughout the world, I have decided to host international conferences on the five continents of the world. I shall be writing about the result of this new initiative in the following columns.